Finally, a single device that provides relief from BACK PAIN.SCIATICA.NECK PAIN.SHOULDER PAIN.KNEE PAINAND MORE! 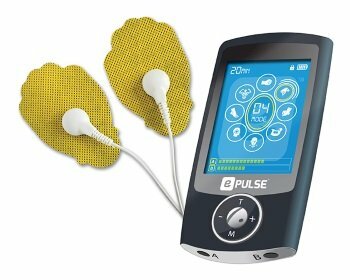 e-Pulse® Ultra is a feature-rich Neuro Stimulator unit that can be used for pain relief anytime, anywhere. e-Pulse® Ultra helps provide relief from back pain, headaches, shoulder and neck pain, sore hips, Sciatica, knee and ankle pain. e-Pulse® Ultra offers both TENS and EMS therapies to help not only relieve pain but also strengthen and tone muscles. Ask your doctor, chiropractor or physical therapist if e-Pulse® Ultra is right for you!